The Academy Awards (the "Oscars") is a motion picture awards show that has become an increasingly left-wing display of political correctness by Hollywood, held annually in February in California. Traditionally it was a yearly award festival for movies, given by the Academy of Motion Picture Arts and Sciences since 1929. The Academy of Motion Picture Arts and Sciences has, over the years, been controlled by many immoral characters and informal lobby groups, most notably homosexuals and communists and supporters of Al Gore who wish to contribute to the promotion and funding for "global warming" causes by giving him "critical acclaim." Conservatives are regularly passed over, despite the superiority of their work/acting, and lifetime achievement awards are doled out to those who have been active in liberal politics. The first awards were presented at a private dinner with an audience of less than 250. Subsequently, the show has been broadcast to the public, since 1953 by television (and previously by radio). For the first decade the show's results were given to newspapers for publication at 11 p.m. at the night of the awards; this method was ruined when the Los Angeles Times announced the winners far too early, and the results were available to those arriving to the show, and, as a result, the Academy adopted the sealed envelope method, which it still uses today. The show was broadcast internationally starting in 1969, and currently has viewers from more than 100 countries. Since 2002, the awards have been broadcast from the Kodak Theatre. Today, according to Rules 2 and 3 of the official Academy Awards Rules, a film must open in the previous calendar year, from midnight at the start of January 1 to midnight at the end of December 31, in Los Angeles County, California, to qualify. Rule 2 states that a film must be "feature-length", defined as a minimum of 40 minutes, except for short subject awards and it must exist either on a 35 mm or 70 mm film print or on 24 fps or 48 fps progressive scan digital film print with native resolution not less than 1280x720. The major awards are given out at a live televised ceremony, most commonly in February or March following the relevant calendar year, and six weeks after the announcement of the nominees. Many Hollywood elites attend, men dressed in tuxedos and the women dressed in expensive evening gown's. The Awards show was first televised on NBC in 1953, it is the only awards ceremony televised live across the United States excluding Alaska and Hawaii; the Emmys, Golden Globes, and Grammys are broadcast live in the East Coast, but they are on tape delay in the West Coast. The Academy Awards have often been criticized for being overly liberal. Many celebrities make political statements in their acceptance speeches. Studios also lobby heavily for their films to be considered, leading to the complaint that nominations and awards may be largely a result of this lobbying rather than the quality of the material. In recent years, the Academy has selected liberal activists to host the awards such as Whoopi Goldberg, Chris Rock and Jon Stewart, who tend to target conservatives in their opening monologues, especially George W. Bush and Donald Trump. At the 2009 Oscars, the Academy nominated "Milk", a gay pride film, for the Best Picture Oscar. When Sean Penn accepted the Best Actor oscar for portraying the title character, he took the opportunity to criticize those who voted to ban gay marriage, and to praise Barack Obama. Presenter Whoopi Goldberg also took the opportunity to blast Nuns as she described nominee Amy Adams in the Supporting Actress category. At the 2013 Oscars ceremony, Hollywood blatantly displayed their ultra-liberal bias when the producers arranged for Michelle Obama to present the Best Picture award on a live transmission from the White House, regardless of the fact that the Obamas had absolutely nothing to do with any of the nine films nominated for the Oscar that year. This fact was so apparent that even several liberal media publications noted it's pointlessness in reviews of the show the following morning, as did conservative commentator Michelle Malkin, who stated that unlike Ronald Reagan's pre-recorded segment at the Academy Awards in the 1980s (who was known as a prominent movie actor and SAG President before moving into politics), the First Lady had no involvement whatsoever in the film industry. In a similar decision, the Academy, at the 2016 Ceremony, tapped Joe Biden as a presenter at the awards in order to introduce a performance from pro-gay nominee Lady Gaga, despite Biden's complete lack of involvement in the film industry. American Beauty was one of the most positively received movies of 1999. At the 72nd Academy Awards, it was nominated for eight awards, including Best Picture, Lead Actor (Spacey), Lead Actress (Bening), Director, Cinematography, Score, Editing, and Original Screenplay. It won in every category except for Best Score, Editing, and Lead Actress. ↑ About the Academy Awards (English). Academy of Motion Picture Arts and Sciences. ↑ Notably Milk, a nominee for Best Picture at the 81st Academy Awards. Al Gore's An Inconvenient Truth has also won two Oscars for "Best Documentary" and "Best Original Song." 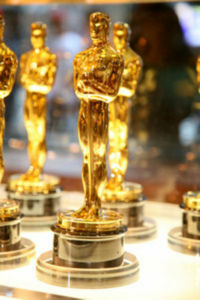 ↑ 4.0 4.1 History of the Academy Awards (English). Academy of Motion Picture Arts and Sciences. ↑ ABC Pot Calls Kettle Black: Oscars Too Political? This page was last modified on 27 February 2017, at 22:51. This page has been accessed 32,761 times.